The location of the institution is shown on the 1914 map below. St Nicholas' site, Pyrford, c.1914. 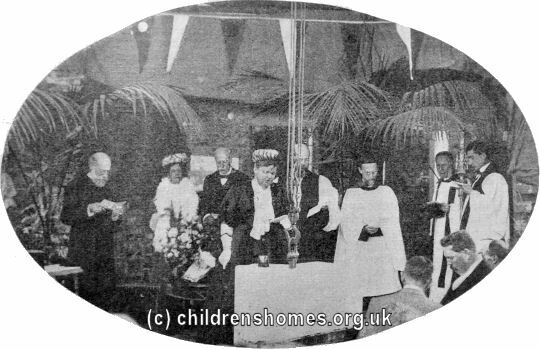 The foundation stone for the new building was laid by the Duchess of Albany on 27th September, 1907. The occasion was also attended by the Bishop of Winchester, the Rev. Edward Rudolf (Secretary of the Waifs and Strays Society) and Mr E.J. May (the new building's architect), pictured below. 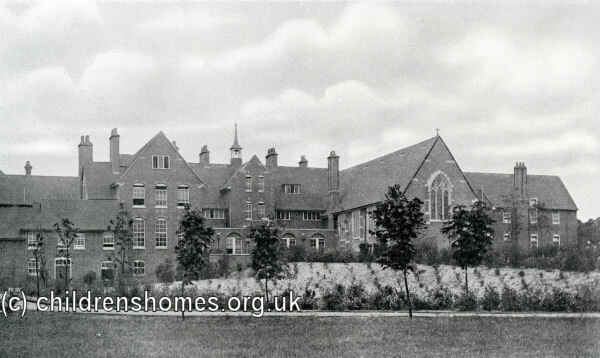 The new premises were completed in 1908 and officially opened on July 25th by the Bishop of London. The approach is from the north, and on the opposite side of the building will be the living and sleeping rooms, all having a due south aspect. The building divides itself roughly into two divisions, viz.—the day part, and the night part. 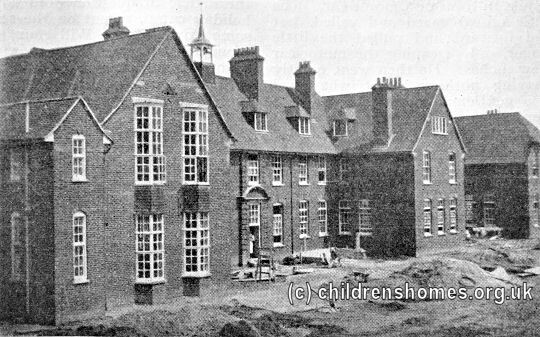 In the former, or eastern half, will be grouped together the school and class-rooms, two play-rooms overlooking the playground, with lavatories and cloakroom by the children's entrance. On this side of the building also will be the dining-room, with the kitchen, sculleries, etc., next to it. In the centre of the building come the rooms for the staff, all facing south; and opposite to these, to the north, the dispensary, with small splint and appliance store-room, matron's office, etc. 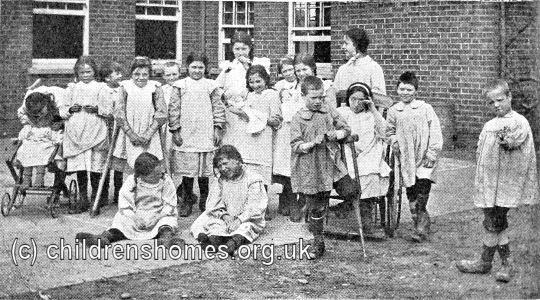 The night or western side will contain the dormitories, on the ground floor — one for thirty girls, and one for twenty boys; these rooms will be exactly repeated above on the first floor, thus giving accommodation for 100 beds. Between the dormitories will be a wide and easy staircase, so arranged as to make the supervision of all the dormitories easy for one nurse at night. Each dormitory will have its sanitary block, arranged on the principles of a hospital ward, and separate bathrooms and lavatories for boys and girls on each floor. All these various parts will be connected together by a straight wide central corridor, and, being for cripples, there will be no steps on either floor from one end of the building to the other. On the first floor, besides the dormitories, etc., already mentioned, are arranged the bedrooms for the staff, needle-room with clothes, linen, and airing rooms near by; and at the extreme eastern end an isolation block containing ward, nurses' room, kitchen, bath-room, etc. This part will be separated from the rest of the building by an open air lobby, and will have an outside iron staircase down to the ground for the removal of infectious cases, and for reaching this ward without going through the main building. On the second floor will be bedrooms for the maids. The view which we give (above) shows the north or entrance front, the main wing on the left being the dining-room, with kitchen and offices beyond, balanced on the right by the Chapel and a small vestry. This Chapel has been designed as part of the main group, and it is very much hoped that some special offerings may be forthcoming to enable it to be carried out with the rest of the work; otherwise, it is feared this part must wait to be built at some future time. 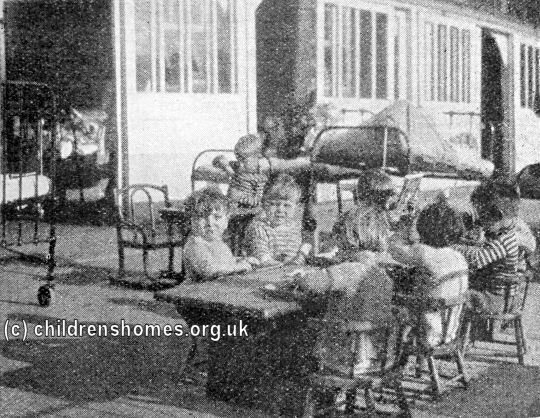 On the extreme right of the view are seen the girls' dormitories on two floors, with west end and south sides; and along the whole length of the south side on the ground floor will be a wide verandah, approached from the dormitory by a French window; this verandah will be available for special cases to sleep in. The exterior design is very plain, in red brick with a tile roof; any effect will depend only upon the main grouping of central block and wings. Adjoining the kitchen block will be a laundry and boiler house for the general heating and supply of hot water. Arrangements have been made with the Woking Company to supply the building with electric light. In a small basement under the kitchen part will be a parcel receiving and sorting-room and china store-room. 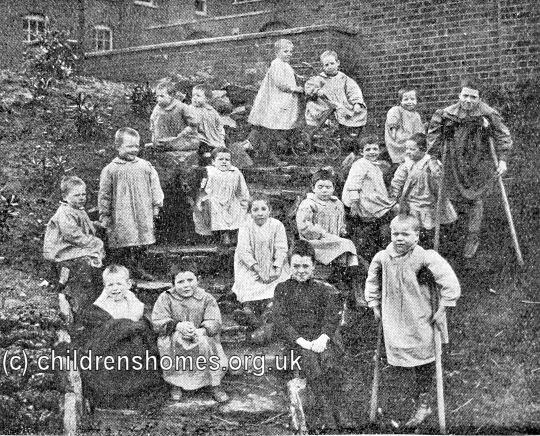 The new buildings could accommodate 120 children aged from 1 to 16, although once boys reached the age of seven they were usually transferred to the Society's St Martin's Home. St Martin's was located at Surbiton until 1916 when it moved to Pyrford, on a site adjacent to St Nicholas'. 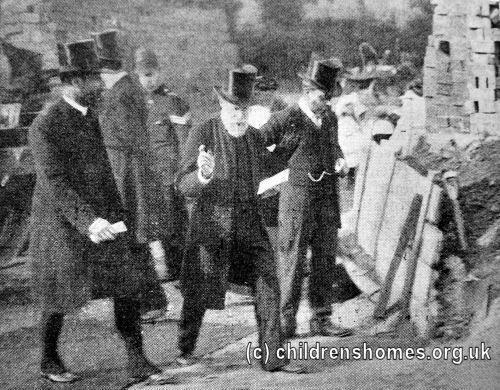 In accordance with medical practice of the time, and when the weather allowed, St Nicholas' made much use of 'open-air' treatments, especially for tubercular conditions. 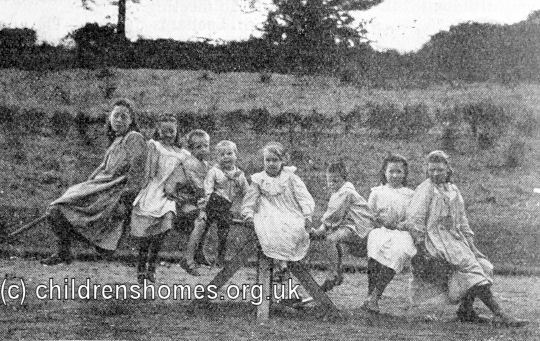 The St Nicholas' and the neighbouring St Martin's home worked closely together, with St Nicholas taking the younger children and older girls. 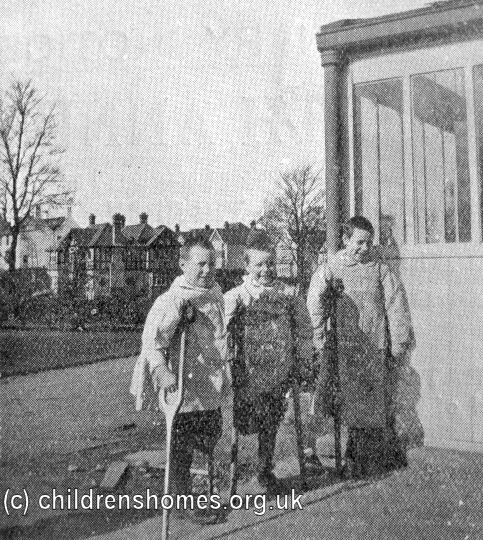 Once boys at St Nicholas' reached the age of seven, they were transferred to St Martin's. 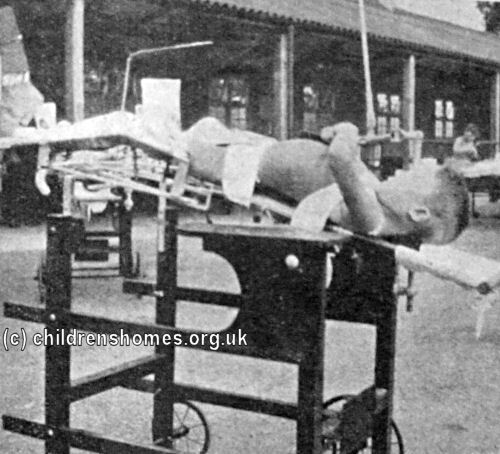 In 1923, the two establishments were formally amalgamated under the rather cumbersome name of the St Nicholas' and St Martin's Orthopaedic Hospital Homes and Special School of Recovery. For quite a few years afterwards, however, the two establishments seemed to have retained something of their own identities, at least as far as the outside world was concerned. The layout of the two institutions is shown on the 1935 map below. 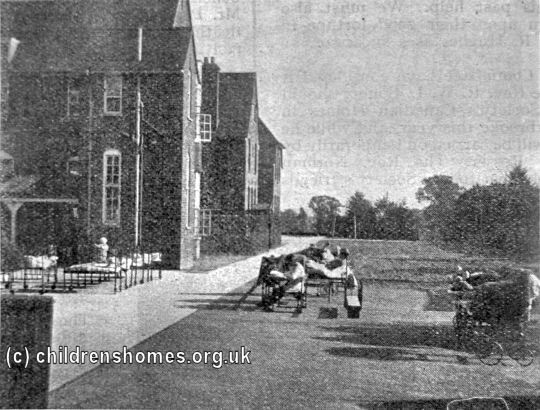 St Nicholas' Home site, Pyrford, c.1935. Below is an aerial view of the St Nicholas' and St Martin's site dating from around 1935. 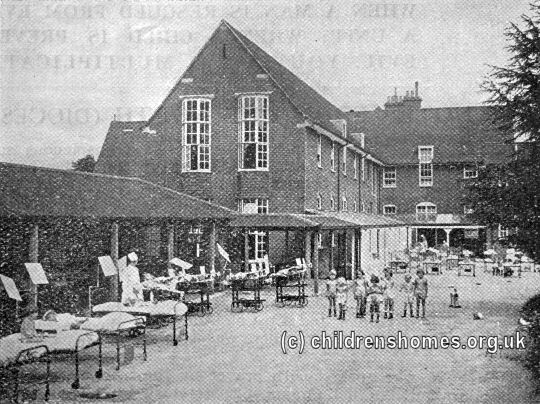 The number locations are as follows: 1.—St Martin's Hospital, with its two-open air wards. 2.— Boys' playing field. 3.—Splint-making workshop. 4.—House surgeon's cottage. 5.—Staff tennis courts. 7.—Curative bath and sun-ray room. 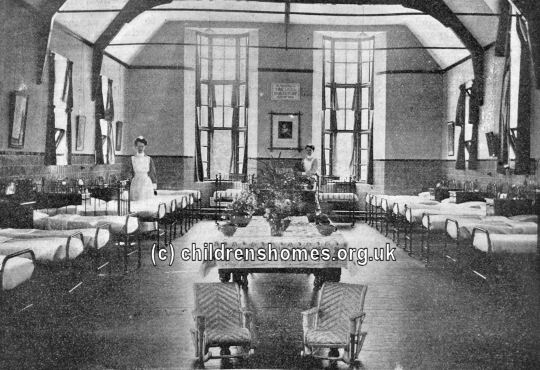 8.—Night nurses' quarters, recreation room, lecture with workshops and school teachers' rooms below. 9.— St Nicholas' Chapel. 10.—Isolation ward for new admissions. 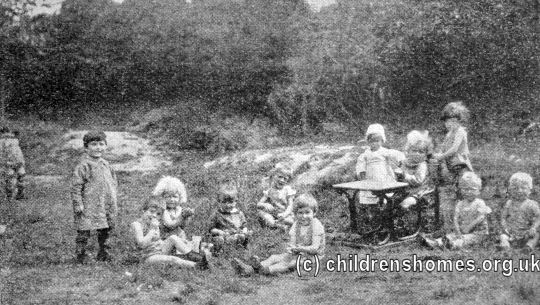 11.—Under-fives' wards. 12.—Operating theatre. 13.—Open-air ward for older girls. 14.—Open-air ward. 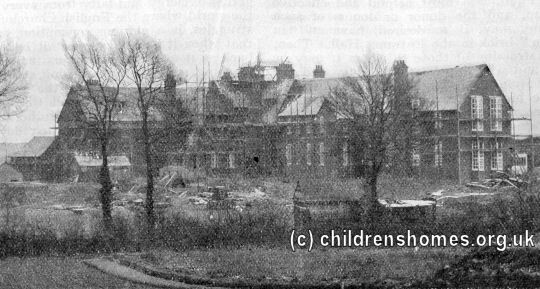 In 1940, the site was taken over by the Ministry of Health for use as a wartime Emergency Hospital. In 1948, the institution joined the newly inaugurated National Health Service under the name of the Rowley Bristow Orthopaedic Hospital, named after its long-serving former Surgical Director. The hospital closed in 1992. The buildings no longer survive and modern housing now covers the site.